OOP was all the rage a few years ago, but appears to be losing some of its luster. CMU has gone and done what lots of folks have been discussing on blogs and lists for some time. “Objects never or hardly never” was a topic on Mark Guzdial’s blog not too long ago. This entry was posted in Uncategorized and tagged College Intro Courses, Innovation, OOP on March 24, 2011 by Stacey Armstrong. TCEA Panel Summary – What is the Future of AP Computer Science? Today in Austin, Texas at the TCEA state convention, Bill Dunklau organized a panel to discuss the proposed AP CS Principles course. Bill served as the panel moderator. Teresa Dahlberg, representing NSF, and I served as live panel participants. Several others participated via Skype. Bill provided an intro and began the AP CS Principles Pilot awards. Awards were given to the colleges currently piloting courses based on the AP CS Principles framework. Various awards were presented to recognize the different approaches used to deliver these pilot courses. Chris Stephenson wrapped up the panel via Skype. She provided information about the role of CSTA. Hopefully, the panel discussion provided useful information to all that attended. This entry was posted in Uncategorized and tagged ap computer science, College Intro Courses, Really Cool New Stuff, Teaching Tools on February 10, 2011 by Stacey Armstrong. The 30th anniversary of Pac-Man has come and gone. What a cool game! I remember playing Pac-Man on 25 cent arcade machines when I was a kid. We had a local arcade / pizza house that all sorts of video games. We had Space Invaders, Frogger, Galaga, Pac-Man, Donkey Kong, Phoenix, and Asteroids just to name a few. Due to my fond feelings about arcade games and my perception that my students like them as well, I have my students complete several of these games in my classes. 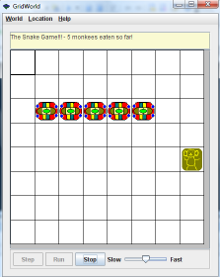 I have a GridWorld Snake Project that can easily become PacMan. I also have Space Invaders and Pong projects using Frames and Java Graphics. I ported over my Pong project over to Scratch and use that in our intro CS class. We also created Pac-Man in XNA / C# as an end of year project. The students had to research grid-based gaming and the A* algorithm. The project was fun. My students love building interactive projects and really enjoying playing what they create as well as playing what others in class create. It is very educational for the students to design and build a game and then explain that creative process to other students. This entry was posted in Uncategorized and tagged College Intro Courses, Teaching Materials, Teaching Tools on May 27, 2010 by Stacey Armstrong. Both of these courses use Scratch and cover some really cool CS topics. The focus is not 100% on just programming, but more focused on how CS affects the world around us. I think more high school intro CS courses would better serve students if they would follow suit. This entry was posted in Uncategorized and tagged College Intro Courses on August 16, 2009 by Stacey Armstrong.